IPLEX-2018 is one of the South India’s biggest exhibition on plastics, organized by TAAPMA—Telangana, Andhra Pradesh, Plastics Manufacturers Association between August 3 – 6, 2018 at Hitex Exhibition Centre, Hyderabad. 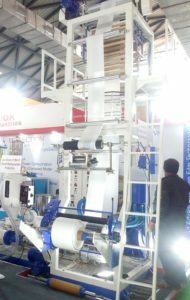 The exhibition has drawn quality 50,000 plus B2B visitors. 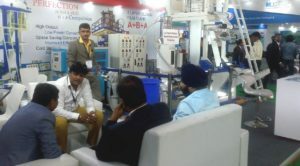 The 9th edition of IPLEX-18, was supported by the industries across India & Globe with 350 exhibitors showcased their products, machinery, and equipments. Advance Bio Material P. Ltd. has shown a live demo of processing biodegradable and compostable raw material grade-ADFLEX-FT-1TM at two different Stalls. We have received huge response from the visitors on both the stalls. Visitors were eager to know about our raw materials, its different grade and applications. Along with the information, visitors and have got the first hand experience to see the processing of this kind of raw material. Many have shown interest in taking up the trial immediately after the exhibition in their own facility. Advance Bio Material P. Ltd.